thank you thank you thank you thank you!!! this has been driving me nuts for months – ever since I had the same repair – you’ve just saved me wiping my profile and creating a new one (which was suggested by an apple tech) – funny thing is, it was fine in every other profile on my mac, except mine (up until now!). Thank you for posting this, and for figuring out the solution!! It fixed mine too, also had had new logic board installed–after having spent several hours on the phone with Apple support, who tried to do everything possible.They had me create a test identity where touchpad scrolling worked fine. Was about to bring my Mac into Apple store for a few more lost days. So thanks again! You’re very welcome. I’m glad when writing about my experience helps someone else! thank you! so glad that i found this post. saved me hours of time on the phone and searching for fixes!! Just worked for me! Mid 2014 MacBook Pro No Scrolling after update to 10.12 ! This fixed it!! THANK YOU!!! Thank you!! This did help me today!! Doubt I would’ve thought of it! Thank you ! Same problem, was driving me crazy, you saved the day! I can’t thank you enough! 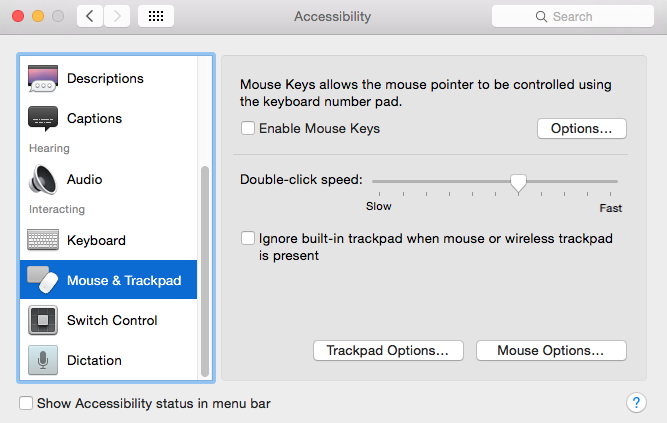 I also came up with the idea of looking in the Accessibility panel, and didn’t see the “Mouse & Trackpad” at first – because I couldn’t scroll! 🙂 When I saw your blog, I did a face-palm and went back in. Thanks SO MUCH! This is a brand new 2016 MacBook Pro and a software update seems to be what broke it. I had added an old Wacom Bamboo Fun pad to my system. I opened the Wacom icon in preferences and saw the scrolling was enabled. I disabled it and the problem was solved. Thank you. Saved me many hours of frustration. Hi, I’m having the exact same issue but I reinstalled my Mac OS using the disks I got with my 2011 Macbook after a logic board replacement from Apple. I can’t find the ‘Accessibility’ control panel, only a ‘Universal Access’ which doesn’t provide me with any useful options. Am I looking in the wrong place or do I need to update my Mac OS?? I’m not sure which version of OS you’re using, but I checked for 10.6. The icon for Universal Access looks the same as the current icon for Accessibility, so I would guess they might be about the same. However, I would definitely upgrade the OS as far as you can. Try looking in the settings for Universal Access first, and see if you can fix the trackpad issue as described. In any case, update to a more current OS. It looks like you ought to be able to run 10.11, judging from the info I found on the MacBook Pro from 2011 at everyman.com. hi, I have the problem, scroll stopped working all of a sudden last week, and would not work despite doing all the things mentioned above. PDF files cannot be downloaded on google chrome as well. these two problems started at the same time. I would appreciate some help. it really drives me crazy as I have had my MacBook pro only for a year. Did you make any changes at that time? For instance, did you install any new software or any update that could have caused these issues? Does it happen only in Chrome or in all programs? If you’re still under warranty or AppleCare, taking it to an Apple Store might be your best bet (or if you don’t live close, you can find service in your area through Apple Support). I tried this setting ” defaults write -g com.apple.trackpad.scrollBehavior 2 ” which was suggested by someone in the Apple Discussions but didn’t work for me. I was having a problem with scrolling, and this solved my problem. Thanks! Please allow my to add my appreciation. I knew it was somewhere in Accessiblity, but couldn’t find it till I found your post Mr. Dunkelberg. Thank you. Thank you! Have been wondering why I couldn’t scroll. I checked my Trackpad settings but did not know about the Accessibility settings. It’s amazing that the solution in the Apple forum for this problem sends you to Terminal. I don’t mind using Terminal but this solution required fewer steps and no restart. Just got a new MBP and have been scrolling using the trackpad whereas on my trusty 17-incher I didn’t particularly care. Now I can scroll on both machines and that makes me happy. Good on you for knowing your computer and how it works! It’s amazing how many neat tricks it can do if you take the time to suss them out. Thank you. That was amazing!!! I did check accessibility and options set, however scrolling on trackpad still does not work while in email only. If the issue is only in one program, the issue could be with the preferences in that program. Are you using Mail, Outlook, or something else? My MacBook 15 (Mid-2012) just got back from a logic board replacement with Apple, and I had this same problem. Thanks for the quick fix! I was actually told by Apple that there was no solution to my inability to use two finger scroll and that it was a migration issue. The only solution, they said, was for me to reformat my computer and NOT reinstall all my files from a Time Machine backup, but instead to reinstall all files manually, which would take weeks in my case. So, I just gave up and went without two finger scroll, just making do the old school way (dragging the right-hand scroll bar down). BUT, this solution WORKED (changing the accessibility functions)!!! It only took 3.5 years for me to have stumbled upon this page, but better late than never. THANKS! I’m glad this old post helped you out. OMG. THANK YOU SO MUCH. I’ve replaced my Trackpad hardware, posted on Apple Support Forums… nothing has helped… until I came across his webpage. I have been without scroll functionality on my trackpad for the better part of 2 years now. Thank you thank you thank you. You’re very welcome. I’m always glad to know that a post about my experience with technology has helped someone.